There is so much to say about the wonderful Apple tree, but alas, all we have time for is a brief fly over. Apples originated between the Black and Caspian Seas. Archeological records find dried Apples used as food in 6500 BCE during the stone age. Indeed they are so important a food source that apples and humans seem to have co-evolved, each one depending on the other for the propagation and dissemination of our respective species. Apples were the favorite fruit of the ancient Greeks and Romans so we find reference to apples more than any other fruit in western literature. A private Apple Orchard in Long Grove, IL“As American as apple pie?” Actually there were no native Apples in North America only their small, tart, uncultured relative the Crabapple. The earliest European settlers brought live trees, not seeds because only live trees would produce the large juicy apples that we love. Remember the co-evolution I was talking about? The earliest writings of China, Egypt and Babylon show that people understood grafting (cloning) of fruit trees. If they had brought seeds as Johnny Appleseed did, the genetic make up of the new tree would be completely different than the parent and usually a big disappointment. At first Apples didn’t produce very well in the new world because the native bees didn’t pollinate the imported Apples. Remember the co evolution? Only after the Europeans brought Honeybees in 1622 did the Apples consistently bear fruit. John Chapman or Johnny Appleseed (1774-1845) was a Swedenborgian (as was once the author of this article), who wanted to serve God and who’s dream was for the land to produce so many Apples that no one would ever go hungry. He collected seeds from cider mills and gave them to anyone going west. For 40 years he planted these seeds in Illinois, Indiana, Ohio and Iowa. Didn’t Johnny know, as the Babylonians did, that non grafted Apples yield fruit that is sub standard and usable only for making hard cider? Remember co-evolution? Johnny’s Apples may not have been edible but his seed spreading gave the Apple a vast genetic storehouse in this country that never would have been achieved if we only grew grafted trees. From this genetic bank Apple breeders have selected all of the delicious varieties that we enjoy today. A medium size apple takes the energy of 50 leaves to produce, has only about 80 calories, is fat and sodium free and if you eat it with the peel it has 5 grams of the fibre pectin, as well as lots of powerful disease fighting antioxidants. "An apple a day really does keep the doctor a way". Americans consume about 21 pounds of Apples every year, they are the second most valuable fruit grown in the US, and one out of 4 is exported, maybe because Europeans annually eat 46 pounds of Apples. Apples are #1 on the list of the "dirty dozen" fruits that if you are concerned about pesticides in your food you should eat organic. This is because conventional orchards do a lot of pest control with highly toxic organophosphates that remain in the fruit in trace amounts. Guess What’s In Flower This Month? It’s the shade trees that are flowering. What? You’ve never noticed? You’re not alone. 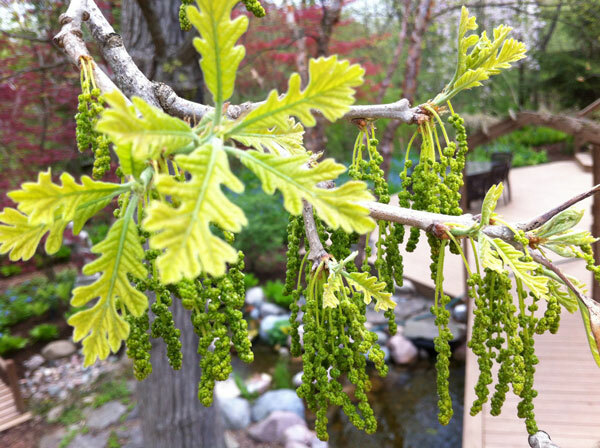 Many people are surprised when we tell them that their Maples, Oaks and even Pines are in flower. The reason that we don’t see shade tree flowers is that they don’t need to be showy or fragrant to attract insect, bird or bat pollinators. What they need is something that we have plenty of in April, WIND. In addition, there are no leaves this month to inhibit the wind from doing its cross pollinating job. There are some species where both male and female reside on the same tree and yet they have clever mechanisms to prevent the tree from pollenating itself. These are called monoecious, and include Alder, Birch, Beech, Oak, Hickory, Spruce, Pine, Arborvitae and many others. Unfortunately, their pollen may cause an allergic reaction. Some tree species have the male and female flowers on different plants to insure cross pollination. They’re called dioecious and include, Maples, Ash, Poplar, Willow, Yew, and Juniper. If you are allergy sensitive you want to promote the female of these species, which are the ones that bear fruit, and avoid the male plants because their pollen is more numerous, lighter and tends to cause more allergic reactions. It is a curious and sad fact that with the purpose of eliminating messy berries, pods or seeds, landscape committees and tree planning commissions have unwittingly mandated the planting of those male, dioecious trees which are the worst allergy producing trees. So why is cross pollination so important? Cross pollination creates genetic variation so that trees have a variety of resistance to diseases, insects and adaptability to changing climatic conditions. Trees, like people, have survived down through the ages because of genetic variation. So even though it causes a reaction for allergy sufferers, cross pollination is a very good thing. Did you know that most of our municipal street trees are cloned? That means that they are all exactly genetically identical. This is kind of scary. Trees, plants, and animals have survived because they’ve had a variety of strategies to deal with the many challenges faced in their long history. Tree cloning shrinks and drastically reduces a tree’s ability to survive in a changing world. It is important to note that there is a direct connection between over planting one species and epidemics like Dutch Elm Disease, and Emerald Ash Borer. So what survival lessons can we learn from the trees and their wind flowers? The most obvious lesson is that plants have survived because of diversity. When we select a tree for our home landscape or street-scape, plant something different than the trees that we are familiar with. Check Arborsmith’s list of replacement trees on our website. Use native plants whenever possible to promote diversification and health. If you are an allergy sufferer, request a female tree when planting a new replacement. This spring, look for the tiny but beautiful flowers that are the evidence of millions of years of tree survival. Last weekend, Gil and I co-taught a new class with Jeanne and Verd Nolan of the Organic Gardener at the Chalet Nursery for their spring lecture series, titled The Power of the Organic Landscape Garden. It was a spectacular success so I thought I would share some of the juicy bits with all of you! There is a lot of confusion about what it means to be organic. The US Department of Agriculture actually certifies food growers to carry the label “organic” which means they have gone through a pretty rigorous process to prove their production meets a strict set of guidelines (you can read all about it here: http://www.ams.usda.gov/AMSv1.0/nop. Mulching under our trees also saves time mowing the lawn which preserves the use of fossil fuels, reducing pollution, in addition to eliminating the need for the use of many artificial fertilizers or pesticides because it increases the tree’s natural ability to fight off invading insects and diseases. Trimming using horticulturally sound techniques, the only ones Arborsmith uses ;-), to prevent the creation of disease and ill health. Eliminate the use of pesticides and herbicides on our lawns. There are lots of ways to tackle the weed problems in our lawns without the use of herbicides but maybe the most important one is to remember that perfectly dandelion and clover free lawns are not normal natural or healthy and those “weed” flowers are great honeybee and butterfly oasis food. Compost our vegetable matter from the kitchen and our green waste from the yard. There is so much more to say but if you would like an evaluation of your property to move towards a more earth friendly landscape check out the Conserve Lake County Conservation@home program or give your earth friendly Arborsmiths a call. We would love to consult with you on how to save your little corner of the world and make it a more healthy place for us all.